Preparations take place in the Assyrian and Egyptian courts of Crystal Palace in Sydenham Hill for the erection of the brick and plaster reproductions of the Colossal Abu Simbel figures. Four colossal statues of Rameses II originally stood outside his temple at Abu Simbel (Middle Kingdom, ca.1270 BC). 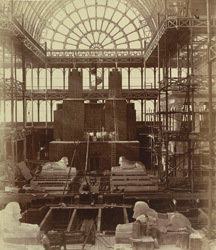 Designed by Joseph Paxton to house the Great Exhibition of 1851 in Hyde Park, the Crystal Palace was reconstructed and enlarged in Sydenham, south London. The first column was raised on 5 August 1852 and the palace was opened by Queen Victoria on 10 June 1854.